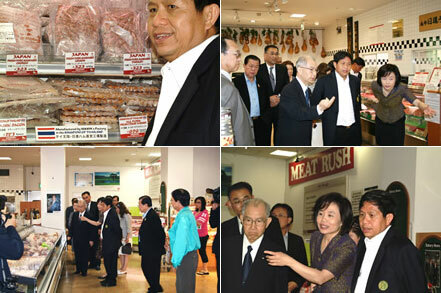 Mr. Somsak Prissanananthakul, the Minister of Agriculture and Cooperatives of the Kingdom of Thailand visited NISSIN WORLD DELICATESSEN on June 14th, 2008. He checked the fruits and vegetable section, specially Thai fruits. He very much interested with our “Meat Rush”. He picked up coconuts milk, Green Curry and spices from the Kingdom of Thailand. 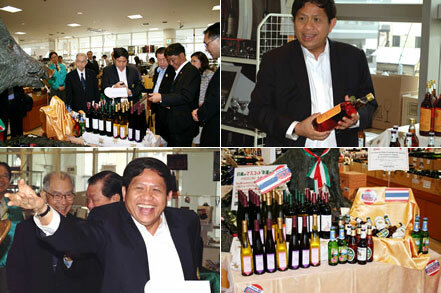 He also visited our Wine and Liquor Section on the 3rd floor. He found Thai whisky and beer. Minister touched the nose of “Porcellino” to receive lucky and happiness. He enjoyed our ham and sausages. 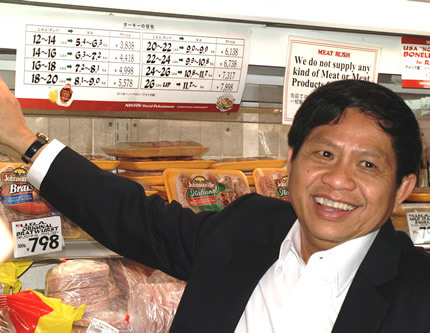 Our Factory in the Kingdom of Thailand has been approved as HACCP (Hazard Analysis and Critical Control Point) Meat Factory by Thai Government. This system is the top qualified system in the world to produce the best quality food with safety, sanitary and cleanness control. The Kingdom of Thailand has set top level food sanitation standard in the world and watching it very seriously and strictly. Every meat processing factory for export are in duty bound to be approved as world standard “HACCP” plant by the government. Toasted to continuously friendship between the Kingdom of Thailand and Japan, and his future success. Having good time with Thai beer. 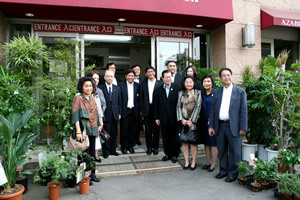 We had a wonderful day with minister Prissanananthakul and we heartily thanked him for his special visit to NISSIN.